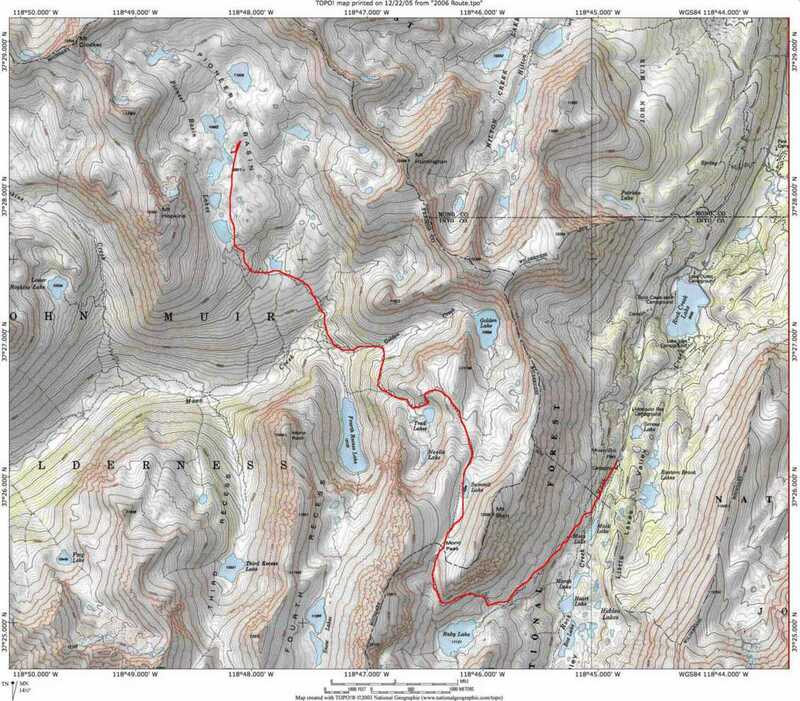 This is a report of a Sierra hike that began at at the Mosquito Flat trailhead, heading into the Pioneer Basin. I include some notes at the end for those who may be looking for information when planning a similar trip. A more ambitious plan for the trip, plotted in the optimistic days of January, is available here. For more information, see my favorite books on the Sierra Nevada. August 8: Having spent the night in Bishop, the five of us (Randy Bytwerk, Bob Kragt, Ed Van Beek, Dan Vandersteen, Marlene Sonderfan) were at the Rock Creek Pack Station to drop off our packs by 7 a.m. We were on the trail soon after, and reached the lower lake in the Pioneer Basin by 2 p.m. Given the amount of snowfall, I’d been worried that the mosquitos might be present in force, but we were late enough into the season such that their numbers were reduced to acceptable levels. August 9: Feeling in lively shape, we headed up Mt. Hopkins. Hopkins is a very easy peak, class 1 most of the way, with a bit of scrambling at the top. However, must of the peak’s side is sandy, more fun to go down than up. The day was wonderful, and we were in no hurry, so we spent a fair spell solving the problems of the world while on top. There was also a good view of “Mud Lake,” our home for four nights. August 10: A pleasant day’s walk through the Pioneer Basin. We headed up the right fork of the trail, a splendid walk with a series of wonderful views. Upon reaching Lake 10862 (the long, narrow one on the map), we split up. Bob settled in at the lake to relax. Ed headed for the upper reaches of the basin, climbing to the top of the ridge east of Mt. Stanford, which has a good view. Dan, Marlene, and I circumnavigated the lake, a delighful stroll. The flowers were in good form. Upon returning to camp, we found we had some of the most interesting neighbors we’d had in the Sierra. First, there was a couple with their four-year-old son Cody, who had made it up on his own resources, and was having a fine time. His parents had sensibly taken the hike in easy stages (spending one night at Ruby Lake, a second at Trail Lakes). I wonder what Cody will be doing by the time he’s 18! The second neighbor was from Mammoth. We invited him over for a beer (one of the benefits of a packer is that beer is heavy to pack in oneself, but empty beer cans are easy to haul out). He showed up in the evening already inebriated, and equipped with a water pipe for his pot. He had further chemical plans as well. We weren’t too enthused, asking him to refrain, which aroused his belligerant side. We let him know that we found him much more interesting sober than otherwise, and had more pleasant conversations with him in the following days. This, I believe, was also the day we repaired Ed’s stove, which involved securing oil from one of Marlene’s fish oil capsules to lubricate the mechanism. The stove worked perfectly for the rest of the trip. August 11: Hikes always look easy to me when I’m planning a trip in January, amidst the snows of Michigan. I promised the group an easy hike to Fourth Recess Lake. Well, getting there was in fact easy, but I thought it would be fun to hike around the lake, to which the group innocently agreed. There is a great deal of talus around the lake. Ed, the mountain goat of the expedition, headed up to the base of the impressive water fall that goes into Fourth Recess. Several of us found ourselves going under a snow cave next to the lake. And there was a rather unpleasant cliff that took considerable effort to get around. There was nothing particularly difficult about the walk, but it did take a lot more work than I had expected. August 12: By now, it was clear that my original plan of hiking out from Pioneer Basin in one day was a product of January fantasies. True enough, I’d done it before, but that was about 25 years ago, when my condition was rather better than it is today, so we agreed to take two days. The goal today was Trail Lakes. The hike out of Mono Creek to Trail Lakes got a bit hot, and took longer than I expected, but upon arriving we found another group just about to leave an excellent camp site. We happily took it over. Trail Lakes gets a lot of traffic from people who aren’t quite up to getting over Mono Pass and down in a single day. The census was about 20 people, which is probably fairly typical. If you’re in good shape, chugging on past it is probably a good idea. Still, there are pleasant camp sites. The ridge overlooking Fourth Recess is worth a trip up, as is the easy stroll up to Nevee Lake. This was the night of the Persiad meteor shower, was was a tad disappointing this year. Ed and I slept out under the stars, and saw some, but the combination fwer meteors than is sometime the case and a bright moon diminished the show. August 13: We got off to an early start, but still took until about 2 p.m to reach the trailhead. We took showers at the Rock Creek Resort, and enjoyed great hamburgers and outstanding pies at the Rock Creek Resort. If you are in the area, don’t miss the place. We then had a long drive to Las Vegas. We often fly into Reno or Las Vegas, and I am always struck by the contrast: One wakes up at 10,800 feet in the Sierra Nevada, and ends the day surrounded by slot machines and neon lights. Be that as it may, we made it in good time to catch our red-eye flight back to Grand Rapids, Michigan. 1. There are numerous good camping spots in the Pioneer Basin. My favorite site is at Lake 10862, but there is no shortage of happy sites. 2. The hike around Fourth Recess Lake is fairly arduous. There is nothing difficult about it, but there is a long stretch of talus, followed by a cliff that requires some energy to get past. The same problem applies to Golden Lake. It’s a bit quicker to get to Mono Pass by going to Golden Lake, as I did some years back, but the talus field one has to cross to head up to Mono Pass is not fun when carrying a full pack. 3. I do recommend the folk at Rock Creek Pack Station. In my younger days, I used to sneer at those who took advantage of those mules, but having reached 56, I find that taking the pack off my back the first day does wonders for my morale. I did not accept one offer — the rental of a bear box for $6 a day — that I should have. I’ve never seen a bear in Pioneer Basin, but the metal box would have been worth it. 4. Although we didn’t do my planned hike over the pass between Crocker and Hopkins, that is doable without particular distress. I’d been to the top of that pass while climing Mt. Crocker some years back, and the Pioneer Basin side is the steepest side. If you’ve got the energy, the trip over the pass and into the Hopkins Lakes basin would be worth it. The Pioneer Basin is a lovely area that I’ve been to three times before, but the only person on the list who has been there with me is Bob Kragt, and that was a long time ago. After several years of challenging hikes, this one will be relatively easy. 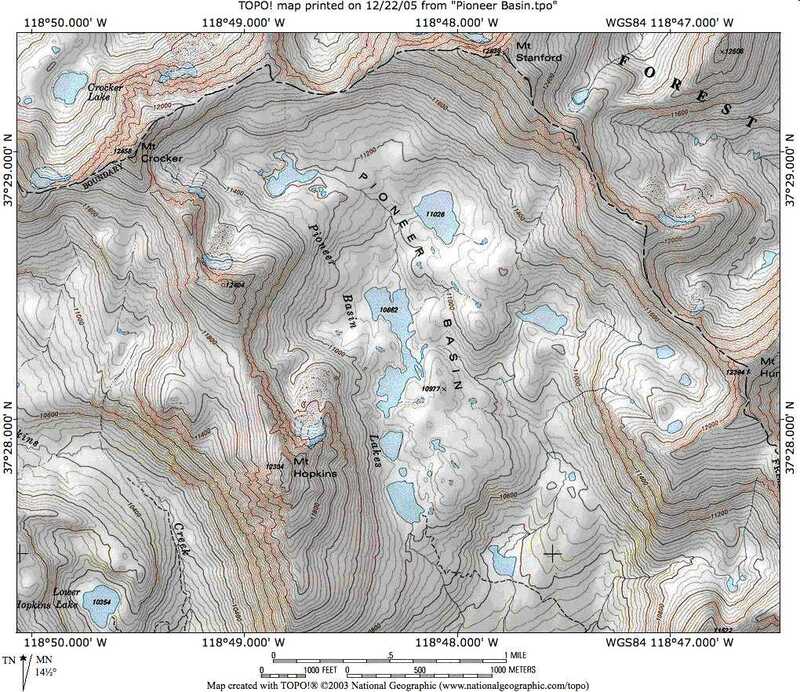 I’m planning on a base camp in the Pioneer Basin. We’ll have our packs carried up by the mules, which will make it possible to hike up to the basin in a day. The packer tells me that campfires are allowed at the lower end of the basin. The scenery isn’t quite as good — but I’m inclined to go where we can have a fire. The plan is to set up a base camp, and take day hikes from there. Mt. Stanford and Mt. Hopkins are easy climbs, both of which I’ve done before. We could also cross-country over one of several passes to neighboring basins. Several of us may take an overnight excursion away from camp, easier since we won’t have to carry everything. August 6: Fly from Grand Rapids to Las Vegas. The flight gets to Las Vegas at 4:45. I’m not sure yet if it makes sense to stay the night there, or drive most of the way to Bishop. August 7: Night in Bishop. Depending on what we do on the 6th, we may have time to wander through Death Valley, or do a day hike. August 8: Hike into Pioneer Basin from the unfortunately named Mosquito Flat. The Rock Creek Pack Station will haul our packs up. Camp at the lower lake (Mud Lake…). August 9: Pioneer Basin. Climb Mt. Stanford? August 10: Pioneer Basin. Head over to Fourth Recess Lake? August 11: Pioneer Basin. Possible overnight trip to a neighboring basin? August 12: Pioneer Basin. Climb Mt. Hopkins? August 13: Hike out, drive to Las Vegas. Celebratory dinner (time permitting). August 14: Leave Las Vegas at 1:00 a.m. on NW 774. Arrive Grrand Rapids at 9:23 a.m.
An extended report, starting from Edison Lake.This hike was in June. The snow is gone by August.